Friends: The Complete Season 1 (Bonus Edition) (1994) The lives, loves, and laughs of six young friends living in Manhattan.Friends-The Complete Second Season: Collector's Edition (1995) Featuring These Special Guest Stars Throughout The Second Season: JULIA ROBERTS. TOM SELLECK. BROOKE SHIELDS. CHARLIE SHEEN. JEAN-CLAUDE VAN DAMME. CHRIS ISAAKThrough thick and thin, Friends has become one of the most enduring viewing habits in television history. Now a DELUXE 4-DISC SET OF THE COMPLETE SEASON TWO, this collector's edition delivers a richer roast of Friends pleasure, containing NEVER-BEFORE-SEEN MOMENTS to make each serving more delicious. 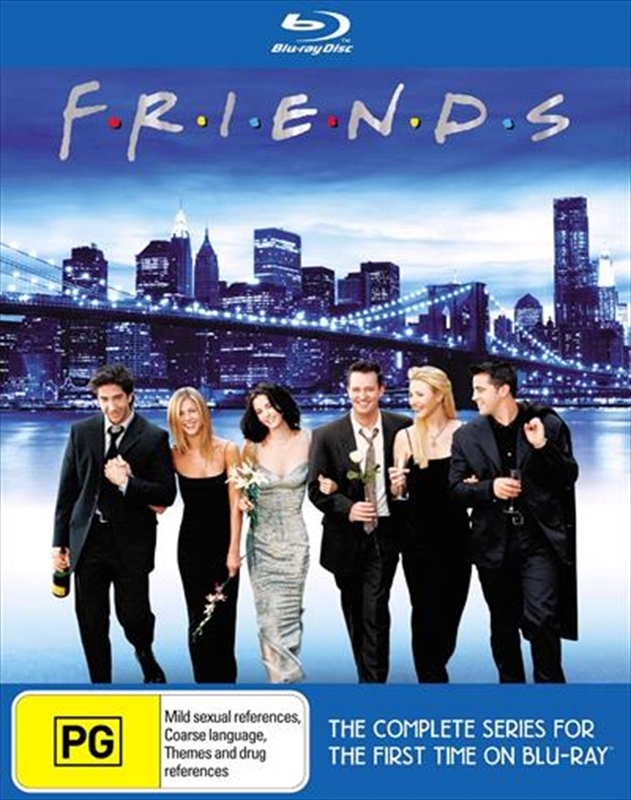 More SPECIAL FEATURES have been percolated to make this the best Friends DVD experience yet.Friends: The Complete Season 2 (Bonus Edition) (1995) The lives, loves, and laughs of six young friends living in Manhattan.Friends: The Complete Season 8 (Bonus Edition) (2001) The lives, loves, and laughs of six young friends living in Manhattan.Friends: The Complete Season 5 (Bonus Edition) (2001) The lives, loves, and laughs of six young friends living in Manhattan.Friends: The Complete Season 4 (Bonus Edition) (2001) The lives, loves, and laughs of six young friends living in Manhattan.Friends: The Complete Season 9 (Bonus Edition) (2001) The lives, loves, and laughs of six young friends living in Manhattan.Friends: The Complete Season 7 (Bonus Edition) (2001) The lives, loves, and laughs of six young friends living in Manhattan.Friends: The Complete Season 6 (Bonus Edition) (2001) The lives, loves, and laughs of six young friends living in Manhattan.Friends: The Complete Season 10 (Bonus Edition) (2001) The lives, loves, and laughs of six young friends living in Manhattan.